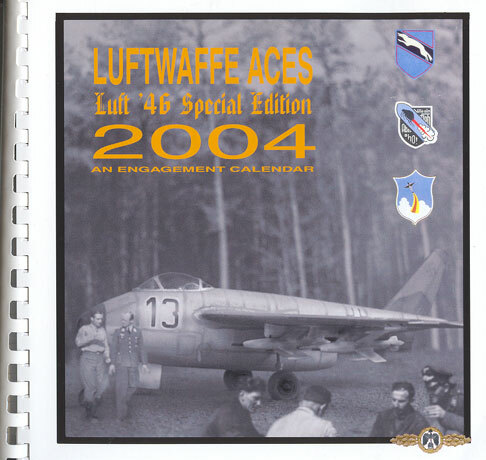 Description and Publisher’s Details: "Luftwaffe Aces Luft '46 Special Edition – 2004 An Engagement Calendar"; self-published by Virgil O’Neil, email virg@vcn.com . This is Virgil O’Neil's third annual engagement Calendar on a Luftwaffe theme. This year's effort, however, features a twist on the original concept. Virgil has teamed up with well-known Luft '46 expert Dan Johnson to offer a "Luft '46 Special Edition 2004 Engagement Calendar". This Calendar follows a similar format to the earlier offerings with a soft cover, bound by plastic spiral ring-binder, in a square format approximately 21.5cm x 21.5cm. There are 94 pages (of which 12 are blank) plus covers. The calendar commences with a one-page foreword by Dan and Virgil, then moves straight to the main content. There is one week to each engagement page. These pages are punctuated with wartime milestones, important late-war Luftwaffe aircraft dates and, of course, US public holidays and other relevant planning information. 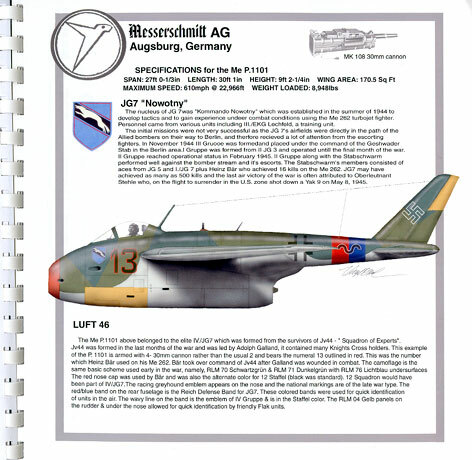 This time, the subjects and the colour artwork are devoted exclusively to late-war and Luft '46 aircraft subjects. Each month includes a composite image of a model in an action setting, a description of the development and/or operations of the type, plus a glossy, attractive colour profile. There are still a few typos here and there, but nothing that will detract from understanding the text or the captions. The Calendar is rounded out with a Gallery of Luft '46 models. Regular HyperScale visitors will recognise some of the names of the modellers who have contributed to this publication, including Floyd Werner, Francisco Soldan, Serge Dompierre and of course Dan Johnson himself. I always look forward to seeing Virgil's latest desk calendar, and this year's edition will be open on my work desk for 2004. It will cost you more than your common Garfield calendar, but it is certainly much more individual too! The price is attributable to what appears to be a short-run, labour intensive production process.